A small dam traps spring-fed water to create this wetland oasis in an otherwise parched land. From the parking lot, take the 0.5-mile paved level trail to an uncovered observation deck. For a different perspective and route back to the parking lot, hike the not-so-level 0.9-mile dirt trail that loops south past a second viewing platform and then west. From Madras — jct. of Hwy. 97 and Hwy. 26 – Travel SOUTHEAST from Madras on HWY. 26 for 8.9 miles to Rimrock Springs WMA – Trail distance: Roughly 1.5 miles total. Rimrock Springs Wildlife Management Area; a fantastic Central Oregon location from which to glimpse superb views of almost all of the iconic mountaintops we all love and appreciate. It’s also a great place to glimpse a wide range of birds, particularly waterfowl and water-loving types like redwing and yellow-headed black birds. If you know what to watch for, you are also likely to see hawks, prairie falcons, great horned owls and nesting birds of prey (at the right time of year, of course). And, not forgetting the ground loving critters, there are tons of deer and rabbits as well as lizards and the occasional gopher snake. My trusty hiking dog and I have been frequent visitors to Rimrock Springs Wildlife Management Area for many years, and as a result we’ve witnessed a lot of change over time – some good, some horrifying and some curious. The good was back when the National Grassland and Forest folks started paying attention to the site, installing paved and gravel walkways all the way down to the wetland oasis and back again, a fancy restroom, picnic tables, benches at strategic locations and eventually; loads of informational signs. A few years ago we began to notice a disturbing and increasing influx of ‘riff-raff’ frequenting the parking lot area when we would visit this trail, including what looked like to me local drug dealers (judging by the activity I witnessed at the time) and low-lifes (judging from the way these folks unloaded the trash from their vehicles and disregarded the restroom preferring to plop themselves out in the open field to do their business – seriously.) And more recently the trash has begun to pile up, and the restroom is frequently vandalized. Even though most of this kind of disturbing activity took place exclusively at the parking lot (and I worried about leaving my car parked there) and not down along the trail (apparently these people are not interesting in actually enjoying nature or taking advantaging of the finer points of a trail system), I stopped visiting Rimrock Spring WMA. But recently, I decided to check back to see if things had improved, or if they had gotten worse. Well, surprise, surprise, surprise! In our zeal to get to the trailhead we almost zipped right past the turnout, sailing perilously down the road toward Madras. And, why one might ask, would this be the case? Someone, and I assume it’s someone official, has taken down all of the road signs indicating a turn out and they have removed the over-vandalized restroom and apparently stopped maintaining the parking lot and zigzag trail leading towards the trailhead (so the weeds have grown to about waist-high). Needless to say, when we arrived and since you can’t actually see if from the road, the parking lot was empty, and if I didn’t know beforehand where to go, I might have assumed there was nothing beyond the parking lot to explore. But rather than being perturbed, I embarrassingly and joyously celebrated! Finally! All of the amenities that seemed to be attracting questionable people and behavior have suddenly been removed – and glorious ever buoyant nature has taken over. Thank the gods of common sense! to the trail review. Once past the parking lot and headed on down the paved trail (past a good quarter mile of weedy overgrowth) you begin to catch glimpses of open rangeland and eventually the man-made water oasis below. According to the signage, antelope are supposed to frequent this area, but in all of my visits I have never seen a one, but I have seen a number of deer from time to time. The whole point of this area becomes evident at the end of the paved trail which flows directly onto a wildlife viewing platform, which is raised slightly above the landscape so as to afford views of the birds below. Be advised that if you really want to enjoy bird watching do take binoculars or carry a viewing scope. And, prepare to stick around for a while, because these critters don’t come out on schedule, but they will show up eventually (early in the day or just before dusk is best for viewing – in my experience). After taking some time to enjoy the first viewing platform, there is another one to check out and that one is located a little ways up the looping gravel pathway along a left-handed fork in the trail. The second platform hasn’t been as well-maintained as the first one, but it’s still very usable. Leaving this platform is a wild looking dirt trail just to the left which will take you down along the wetlands for additional viewing, if you’re so inclined – although I doubt that this trail is an ‘official’ trail, it is an interesting area to check out. Back to the main trail, which loops around the hilltop and back down towards the parking lot, offers a great adventure through the local natural habitat with frequent sightings of whatever wildlife might be lurking in the bushes and juniper trees. Depending on the time of day, one is likely to capture quite a few sightings along the way. The height of summer will find this whole area very hot and very dry, so taking this trek early is the day is advisable. 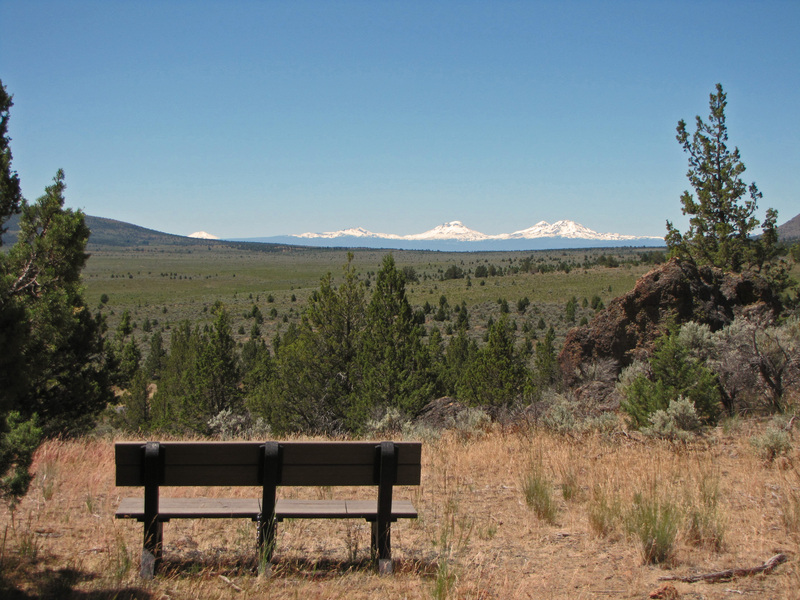 The loop trail back is where the views of the mountainsbegin to enchant most appreciative Oregonians and visitors alike, so prepare to divert off of the trail along alternate pathways and to sit and enjoy the view from at least one appropriately placed bench. What you’ll see: birds galore, deer, small mammals and reptiles as well as bugs (some can be very pesty such as horseflies, so prepare for that and the usual dragonflies and butterflies). WARNING FOR HIKING DOGS: And, I must warn anyone preparing to hike with a dog: there are ticks in them thar hills. This last trip to the wetland oasis we came across a really cute little cottontail that was kind enough to pause for a picture or two. And, when I got back to my computer and downloaded the pictures, zooming in on the rabbit’s photo, it was terribly apparent that the poor little bunny had a number of ticks attached to his ears. So, my advice is to keep your dog on the trail where you’re least likely to encounter ticks. Also – for anyone like me who is a ‘catch and release’ rockhound, there are some interesting mineral varieties to see at this site, including a yellow jasper of some kind which apparently had been mined along the rimrocks by rockhounds in years past. Pack water, binoculars and of course, a camera and above all else, enjoy your hike!